Farmington police Chief Jack Peck offers his support for a bill being offered by state Sen. Tom Saviello (right), R-Wilton, that would expand the state's Medicaid program, MaineCare, on Feb. 23, 2016. AUGUSTA, Maine — By a single vote Tuesday night, Sen. Tom Saviello, R-Wilton, secured approval of his proposal to expand the state’s Medicaid system, MaineCare, by using federal funds to buy private insurance for the state’s poorest residents. Saviello was joined by only two of his Republican colleagues, as well as the entire caucus of minority Democrats, who agreed for the sixth time in three years that Maine should expand state- and federally funded medical insurance programs under the federal Affordable Care Act, also called Obamacare. GOP members joining Saviello to support expansion were Sen. Roger Katz, R-Augusta, and Sen. David Woodsome, R-North Waterboro. Saviello’s victory is bittersweet for supporters of expansion, which is likely to pass in the Democrat-controlled House of Representatives later this week to encounter an all-but-certain veto by Maine’s Republican Gov. Paul LePage. LePage has five times successfully vetoed bills to expand the health care program largely with the support of his Republican allies in the Legislature. Saviello hoped for more Republican support in the Senate, especially from rural lawmakers or those in Senate districts with large hospitals or facing the ravages of the state’s heroin epidemic. During his floor speech, Saviello shared his opinion about why Maine should take advantage of a federal matching rate that provides $9 for health care for every $1 the state spends on coverage. But Saviello said voting against expanded health care for Mainers and their families, along with the federal support that came with it, was the real insanity. 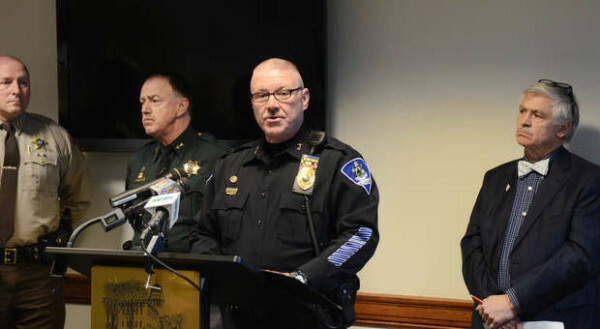 And unlike with previous expansion efforts in Maine, Saviello highlighted how the state’s law enforcement leaders, including the Maine Chiefs of Police Association and the Maine Sheriffs Association, supported this effort, largely to remove those with drug addictions and mental health issues from the state’s jails. Supporters estimate an expansion also would create an estimated 3,000 jobs. But lawmakers opposing the expansion said Maine had a clear track record from previous expansions of Medicaid in 2001 and again in 2003 that left the state owing its hospitals $450 million for the care they provided under the program. Sen. Amy Volk, R-Scarborough, also spoke in opposition to the expansion, noting the state’s previous Medicaid debt as well. Volk said the state should learn from its past experience in trying to expand Medicaid when thousands more joined the program than were projected. Sen. Anne Haskell, D-Portland, said a provision in Saviello’s bill that sunsets the expansion in 2020 if the next Legislature decided not to continue the program and one that allows the state to leave the program if the federal matching rate were reduced amounted to a “belt and suspenders” approach to protecting Maine’s taxpayers. Saviello said economic arguments against expansion ultimately would have to be weighed against the moral ones for providing people with health care coverage. Quoting Ohio Gov. John Kasich, a Republican who supported Medicaid expansion in his state, Saviello alluded to a question St. Peter would ask lawmakers who hoped to get into heaven. “He’s probably not going ask you much about what you did about keeping government small. He’s going to ask you what you did for the poor — and you better have a good answer,” Saviello said.